Mozart’s clever servant offers the bass-baritone a rare chance to play the romantic hero, with ravishing duets for Figaro and his bride-to-be, Susanna. There’s plenty of comic cunning to relish too, not least Figaro’s mock-militaristic Act I aria ‘Non più andrai’, and his attempts to deceive the Count in the Act II ensemble. Mozart’s other memorable bass-baritone creations include the seductive Don Giovanni and his comic side-kick Leporello. Dulcamara’s flamboyant Act I aria ‘Udite, udite, o rustici!’ and his ensuing duet with the gullible Nemorino provide bass-baritones with the ultimate tongue-twisting challenge, as the comic con-man chatters away at break-neck speed. But the ‘doctor’ has a good heart for all his deception, urging Adina to tell Nemorino her true feelings in their charming Act II duet. Boris is one of opera’s most psychologically engrossing roles. He has almost certainly committed a horrific crime to further his ambitions. And yet, the remorse he expresses in his monologues, coupled with his deep love for his people, make it impossible for us not to sympathize with him. Once the property of basses, Boris has been performed in recent years by notable bass-baritones. 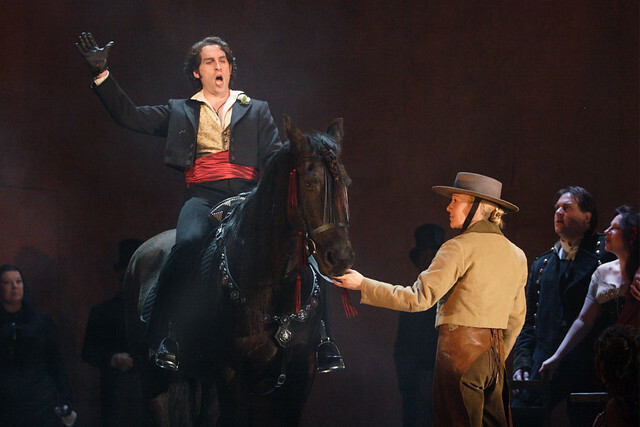 Bizet makes up for the brevity of Escamillo’s role by giving him one of opera’s most exciting and rousing entrance arias: the Toreador’s Song, describing his triumphs in the bullring. Other lesser-known highlights include a lovely duet for Escamillo and Carmen in Act IV, which hints that these fiery spirits have found peace with each other. Wagner wrote some of the greatest bass-baritone roles, and none more so than Hans Sachs. Pensive and wise, with a sense of fun and something of a temper, Sachs is one of the most humane and intriguing characters in opera – with wonderfully varied music, from the jovial ‘Cobbling Song’ in Act II to the introspective ‘Wahn’ Monologue in Act III. Wagner’s other fascinating bass-baritone protagonists include the Flying Dutchman and the mighty (three-opera!) role of Wotan in Der Ring des Nibelungen. Verdi turned to the bass-baritone at the end of his career to create one of opera’s best comic characters: the Shakespearian fat knight Sir John Falstaff. This loveable rogue’s music moves like quicksilver from the grand ‘Onore’ monologue in Act I, through delicate nostalgia in the arietta ‘Quand’ero paggio’ in Act II to the melancholic Act III monologue ‘Mondo ladro’ – though a glass of mulled wine soon cheers him up! Puccini uses the bass-baritone voice’s large range and varied vocal colours to deftly convey Scarpia’s suave villainy. The exaggerated courtesy of his Act I exchange with Tosca, the growling menace of the Act I Te Deum, the violent excitement of his Act II soliloquy and the brutality of his Act II duologues with Tosca all create a vivid impression of a psychotic yet strangely charismatic man. John the Baptist’s low-pitched, rapt prophecies from his prison cell – all the more unearthly as he is unseen – make Salome’s opening scene one of the most memorable in opera. Brought up from his dungeon, Jokanaan reveals a ferocious will as he forcefully rejects Salome’s seduction. Only when he urges her to seek salvation does his music shift to ardent, beautiful lyricism – if only she had listened! He may be less well-known than Puccini's creation, but Nick Shadow (‘Old Nick’) gives Scarpia a run for his money for the title of Best Bass-Baritone Villain. Charmingly debonair in Act I, roguishly destructive in Act II, Shadow finally shows his true colours in Act III’s furious aria ‘I burn, I freeze!’, the dark timbre, wide range and sheer power of his voice creating a terrifying impression of devilish malignance as he condemns Tom Rakewell to insanity and descends to Hell. The Protector is an operatic descendant of Debussy’s jealous husband Golaud in Pelléas et Mélisande. Just as Debussy contrasted Golaud’s dark bass-baritone with the boyish high baritone of Pelléas, Benjamin contrasts the anguished low-pitched utterances of the Protector – occasionally shifting into speech – with the serene purity of the Boy’s countertenor, offering a brilliant portrayal of a troubled and dangerously jealous man. Don't forget: Yeletsky in Pique Dame with the beautiful 'Ya vas llubju' (spelling?) or the Count in Nozze who should be included, if for no other reason, because he gets to sing 'perdono, Contessa.' And what about Wolfram singing 'Die Abendstern?' How about pretty much anything Hvorostovsky has sung in recital, on recording, or on stage? Somehow, the bass-baritone often seems to get a show stopper aria right in the middle of things. 'Di Provenza' anyone? You are 100% correct re: Dmitri. Hoping to hear him at Tanglewood in August. Yes, geat roles indeed, but they are for true baritones, not bass-baritones as featured here. Mozart''s Count has been sung by bassier baritones, but he needs to have a different vocal timbre from Figaro. 1st things 1st. Wotan is THE bass baritone role, so that's a glaring omission...Hvorostovsky is not a bass baritone & Wolfram & Germont are not BB roles...neither are di Luna, Iago, Commendatore, Marcello, or Posa, all roles that others have mentioned. You are so right Rosemary! Anything sung by Dima can be included - some personal favourites - Onegin, Yeletsky, Germont pere, di Luna or Renato/Anckarstrom. Of the roles given in the article I love Scarpia and Jokannan. It would have been helpful to have given cast details of the clips provided. Never thought of Bryn Terfel as Scarpia. Brilliant! Great casting ROH. How about Ruggiero Raimondi as Don Giovanni/Scarpia/Iago? Or Sergei Leiferkus as Iago - surely one of the really great bass-baritone roles? And Willard White in Porgy and Bess? Me, I tend to fall in love with the bass-baritone rather than the tenor! If, as here, you have categorised the baritone voice there seems to be a mix of baritone, bass baritone and buffo bass baritone repertoire listed. Mr Bernays is correct re a number of the roles listed. Then the Verdi baritone is something else again is it not? It is not just about tessitura. Surely the timbre of the voice plays a big part in all this as well? This opera business can be trickier than we think. What it is all about is how each one of us hear's things and to make it really complicated we all hear things in a different way. That is a scientific fact! Whatever, I would not want to do without it enriching my life! By the way Written On Skin is superb! Carlo Gerard in Giordano's Andrea Chénier is one of the most complex and interesting characters ever. He isn't a true villain, more a victim of the hard revolutionary times around 1789-1794. Trapped in his class, his awkward attempt to win Maddalena is clumsy but heartbreaking. I think Zeljko Lucic interpretation of Gerard is absolutely outstanding! I take Sir Thomas Allen as Don Giovanni Or as Ulysse. Besides he made me to feel for Beckmesser (who's an idiot, but kind of a poor one) And I do like Marcello in "Boheme" - he's such a cutie! I love Onegin (and you're right: Hvostorovsky is a wonderful Onegin) and Posa. Kurt Moll, Commendatore scene from Don Giovanni- visceral, passionate and powerful. Wotan is helden (hero) baritone a heavier version of baritone like helden tenor . When a bass sings Wotan its usually a phAse at peak of their career (Tomlinson ,Morris for example ). Nice post and appreciate the commenting. Of course there is a bass-baritone fach. Their secondo passagio is at D4 natural. Because most of the literature was ignorant, except anecdotally, the successful ones cross over many roles that weren't written for their fach specifically. Note: Let's mention Samuel Ramey and his Faustian role specialty of which there was no mention. Cited as "the most recorded bass in opera", he was a bass-baritone with an ample bottom end. My hero and go-to for training examples. Terfel is OK, but Ramey is superb.